We felt the need to discover through a film how the beauty of their performances was born from those prison cells, from those outcasts who live so far from culture. 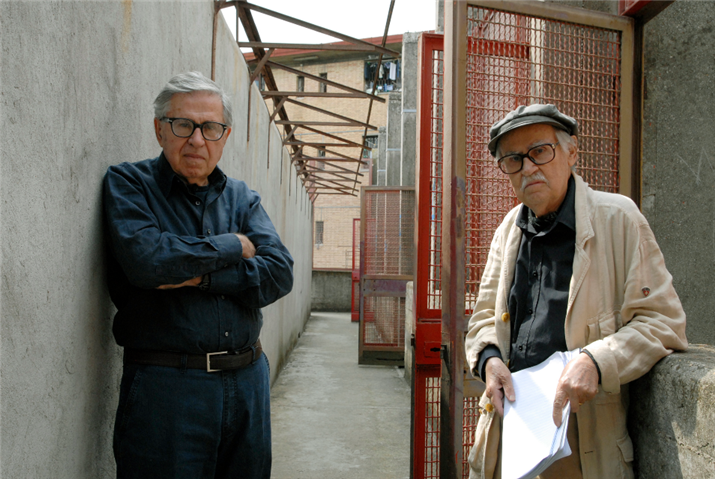 Padre Padrone, The Night of the Shooting Stars, and Kaos, widely known and lauded, along with the more recent Good Morning Babylon, Fiorile, and Elective Affinities, show both the versatility and the artistic integrity of these writing-directing partners who have worked as an independent team for half a century. Having evolved their own means of fusing stark, hard-hitting, everyday reality with lyrical beauty (often sourced in literature by such dramatists and poets as Pirandello and Goethe), these brothers honed a genre of cinematic realism that could also be magical by shooting on location in Italy with their own ensembles of actors, sometimes from the theatre and sometimes lay performers acting “from life.” Documentary and fiction techniques have entered their historical dramas or social critiques with a psychological acuity and lyrical sensibility that astonishes. So maybe, then, it shouldn’t surprise us that the brothers turned to Fabio Cavalli who, over the past decade, has been the joint-head of theatrical activities at the new complex of the Rebibbia Prison of Roma where he directs over 100 convicts in the “Company of Free Associated Artists” that employs inmate-actors of the High-Security block. Over 22,000 visitors have passed through the gates of the detention center as audience members. A “line-up” of a decidedly different nature as inmates perform. Even hardened convicts become jittery awaiting casting decisions. At least two of the faces on this unusual “stage” may look familiar. Salvatore Striano started out as a juvenile offender and then faced long years confined at Rebibbia. Once mentored by Cavalli, he grew attached to the theatre, and when he was granted a pardon in 2006, he took up acting as a profession, first with Cavalli and then with Emanuela Giordano and Umberto Orsini who cast him in Shakespeare’s The Tempest. From there it was on to Matteo Garrone’s Gomorra and work for Abel Ferrara as well as in television. Playing Brutus in Caesar Must Die meant returning to Rebibbia, the site of his incarceration, but this time as an actor. For Striano and the other participants, the first step was casting. On our screen we see the men audition in the same way that the Tavianis have gone about it for the last twenty years: they ask the actors to identify themselves as if they were being interrogated by customs officials; then they must say good-bye to someone very dear to them, first expressing pain and then showing rage. The filmmakers, respecting the men’s privacy and wishes, invited them to use alias names, but all of the would-be actors insisted on giving their real family names and birth places. It seemed a way to remind everyone living freely on the outside that the men were being “silenced” by their imprisonment. The convicts/actors of Rebibbia Prison rehearse a scene. The inmates then needed to “live with” the text for some time, exploring its possible meanings and trying them on for size. By transforming Shakespeare’s verse into contemporary dialogue and his cast into thirteen roles, the Tavianis aided the inmates in identifying with the characters over days of rehearsal and nights of contemplation in their cells. Some of the lines they were learning brought anxiety; others, the great expectation of a gratifying delivery. Entering into a role could be an interior experience, but it wasn’t a lonely one. 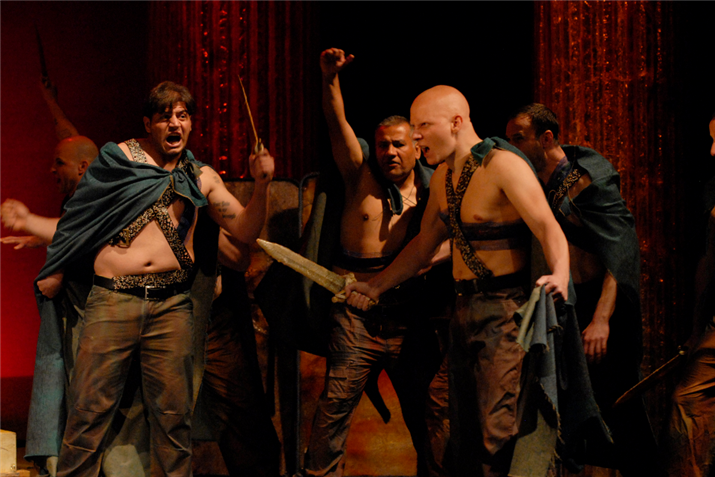 Julius Caesar (Giovanni Arcuri) faces his friends and countrymen on the prison yard . Just the same, for all the awe of Shakespeare’s emotions and the pride of performance on tap for each actor, we see that irony is there, too, both in the script and in the fact of incarceration. Confrontations sometimes erupted in the rehearsal process and threatened the life of the entire production. But opening night finally arrives, and a full house — of inmates, actors, students, and directors — applauds an exceptional event. A conspiratorial moment is shared by Julius Caesar (Giovanni Arcuri) and Decius (Juan Dario Bonetti). Their performances, in turn, contributed to the script’s evolution by sometimes adding another interpretation or even a new character. In the audition we see a very unusual response to the vignettes the actors have been assigned: one wiry man, bent and sneaking up to the table, gestures by bringing his open palm to his nose and then his finger to his lips, hushing the audience. He is the Neapolitan “Pazzariello,” a soothsayer (Francesco Carusone) reminiscent of the crazy characters in all of Shakespeare, except that the bard did not include this one in Julius Caesar. The Taviani’s did; here he becomes a soothsayer entering the play in the rehearsal process. In other ways the play was “dismembered and rebuilt,” say the filmmakers, retaining the spirit and plot of the tragedy but quickening its tempo. 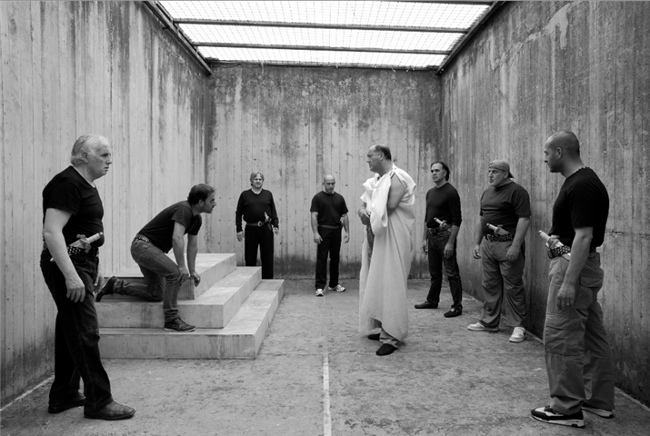 Julius Caesar (Giovanni Arcuri) confronts his friends and enemies in an unusual rehearsal space inside Rebibbia Prison. As such the play addresses the inmates head-on: the flaws, mis-moves, crimes and tragic betrayals of loyalty and trust bring their own pasts to the fore, possibly in a cathartic way, invoking self-recognition along with pity in its ancient sense of purging and healing. We experience that empathy, too, at hardly one remove — but that slight gap is just enough to add a searing jolt, a pang of the broken relationships of the men with their families, with their societies, with us. When Antonio Frasca as Mark Anthony speaks of “honorable men,” we peer at the actors before us and see their full dimension, whether it be love or murder or redemption, and the range of simultaneous emotions is enough to make us feel queasy — what must it do for the performers? The question brings another level of disquiet for us. Brutus (Salvatore Striano) fixes an accusatory stare at the witnesses to Julius Caesar’s murder. In this way the suspense of viewing the film, Caesar Must Die, is very different from that in experiencing the play, Julius Caesar, or another tragedy or even another dramatic film. That suspense is not related to the rising action or resolution of the plot as given, but to actors playing roles — more to the point, prisoners enacting crimes, against the flesh, the psyche, or the heart — but crimes they have quite possibly already committed beyond the stage. What will be the outcome of the role-play for them? This is the question we follow. Is the poetry of Shakespeare powerful enough to counter the agony they might endure? The filmmakers aid us in pursuing this emotional quandary by bringing us outside the play as the Tavianis themselves were, but not outside the prison. Creating that slight distance from the play itself in the sense of a Brechtian “alienation,” one as psychological as it is social and political, at the same time creates a new kind of empathy, one outside the play. Along with the very strangely “larger-than-life” return of Salvatore Striano to perform as Brutus within the prison he has already left behind, we are reminded that in theory (as in theatre) and here, in practice, a life can be re-made. Some other ironic switches occur as well in Caesar Must Die. Fabio Cavalli changes hats from being the theatre director of the play inside the film to playing the director of the film inside the film — the film being made of the play. Outside of that film, Cavalli has gone back to Rebibbia to stage Shakespeare’s version of Julius Caesar with the original text, including a moving scene with Brutus and Calpurnia, eliminated from Caesar Must Die because of the all-male cast. Mark Anthony (Antonio Frasca) orates the contents of Julius Caesar’s will. The Tavianis use transitions between black-and white film stock and color to help us see Caesar Must Die as both a chronicle and a celebration. In the outer narrative, which certainly has a documentary feel to it, black and white cinematography signals the passage of time yet also a distance from everyday reality and even TV naturalism; it permits the directors a sobriety for the images that suggests a tone of potential violence. 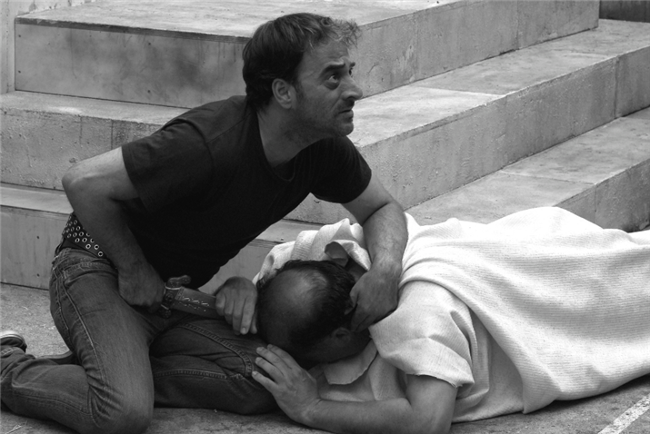 It allows them to shoot on an “absurd set … where Caesar is not killed against the backdrop of ancient Rome but in the tiny cubicles where the inmates spend their time in the open air.” They felt freer shooting in the cell where Brutus, suffering, works through his monologue, ‘Caesar must die.’ In the end the color photography is theatrical, almost magical, expressing the joy of accomplishment shared by the performers on the stage. 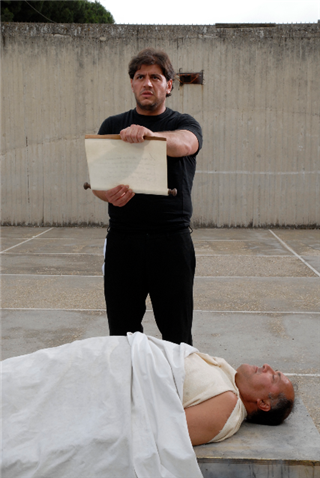 Salvatore Striano reflects on his role of Brutus just before the prison performance. Paolo and Vittorio Taviani on the set of their Berlinale Golden Bear winning film, Caesar Must Die. Director: Paolo and Vittorio Taviani; Producer: Grazia Volpi; Screenplay: Paolo and Vittorio Taviani, Fabio Cavalli; Theatre Director: Fabio Cavalli; Cinematographer: Simone Zampagni; Editor: Roberto Perpignani; Sound: Benito Alchimede, Brando Mosca; Music: Giuliano Taviani, Carmelo Travia. 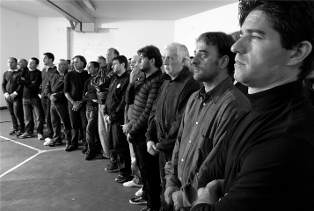 Cast: Cosimo Rega, Salvatore Striano, Giovanni Arcuri, Antonio Frasca, Juan Dario Bonetti, Vittorio Parrella, Rosario Majorana, Vincenzo Gallo, Francesco de Masi, Gennaro Solito, Francesco Carusone, Fabio Rizzuto, Maurilio Giaffreda. Color and B/W, HD, 76 min. In Italian with English subtitles.